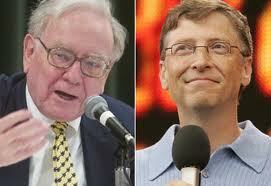 Celebrity English: EPIC Career Advice from Buffett and Gates! EPIC Career Advice from Buffett and Gates! It is the time of year when people are entering the work force full time for the first time in their lives. Whether you are graduating from high school or college the next step feels like a big one! Most people have a feeling of uncertainty and anxiety. What’s next? Will I be able to find a job? What if I make the wrong career choice? This week, I want to take a look at some career advice for new graduates. As our guides or mentors, I have selected 2 pillars from the American Business Community: Bill Gates and Warren Buffett. QUESTION: Mr.Buffett, Mr. Gates, I am Ibrahim Dolly and I came from Portugal. I have a question for both of you. You both knew early in your careers what you wanted to do in your life. What advice do you have for those of us who are a little bit unclear? GATES: Well, finding the thing that you are passionate about and that you are good at can sometimes take a period of years. I think Warren and I were lucky we kind of ran into it. I wasn't even sure it was software. I was kind of obsessed with it but then it wasn't clear it could be a career. When that happened, it was great. I think most other people get into their 20s and have to try out some different experiences. And some things will expose you to a lot of different businesses, a lot of different work opportunities. And I think you can make your first few jobs optimized for getting that exposure. And then when you want it, see the thing that you want to be fanatical about and just jump on to that. Have you found your ‘passion in life’? Have you found something you are ‘good at’? Does your ‘passion’ and ‘what you are good’ at suit your career path? Is it always possible to make your passion your career? Do you agree with Mr. Buffett that “marrying the right person” is important to your career? To all of the graduates entering the work force for the first time: good luck, enjoy, and always be yourself!